the Ada County Highway District (ACHD) maintains local roads withing the six cities in Ada County, which can be a challenging task. Cooperation and help from the community is crucial to help keep our road and sidewalks safe for all users. Similar to the winter season when homeowners are asked to keep their sidewalks clear of snow and ice, ACHD asks you to maintain any vegetation within the public right-of-way in front of and beside your home to help keep motorists, pedestrians and bicyclists safe. If you live near an intersection, keep flowers, hedges and shrubs pruned to less than 3-feet-high (measured from the street), and trees pruned so the lowest branch is at least 10-feet off the ground. 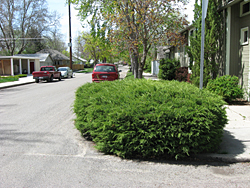 Prune all vegetation that encroaches on the sidewalk in front of your home, so pedestrians have a clear, safe place to walk. 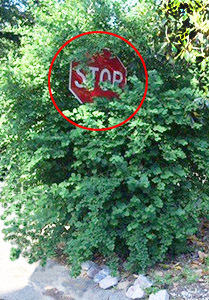 Prune vegatation in front of your home so traffic control signs (street signs, stop signs, etc.) are clearly visible. If you see a sight obstruction or have any questions, please contact ACHD.